Kirkstall Lane, Headingley, Leeds LS6 3DP. Half a mile from Headingley station. Three miles north-west of Leeds station uphill via university district. 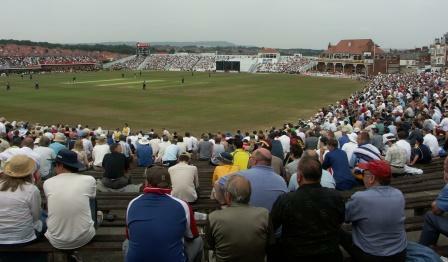 Main stand backs on to rugby ground, hence 'Rugby Stand End'. For 142 years, the ground had not been owned by the club. Facilities hade been allowed to run down, and the club decided to move to a greenfield site elsewhere, but then decided to stay put, which meant that the deterioration continued. 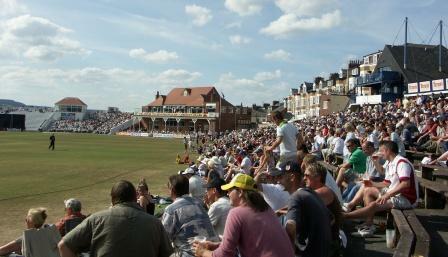 Finally Leeds City Council, worried by the threat of Headingley losing Test status, came up with a �million loan which enabled the club to buy the ground from the "Cricket, Football and Athletic Company" for � million and increase its capacity to 20,000. Abbeydale Park, Dore. Close to Dore station. No longer used for County matches. North Marine Road. 3/4 mile from station, down through shopping centre,then left along St Thomas Street/North Marine Road.